1. Observe the color. Generally, the lighter the color, the lighter the taste. 2. Part your lips as you nose the bourbon and inhale with both nose and mouth. That way, you don’t pull in as much alcohol. 4. Notice the finish, the flavor left behind. 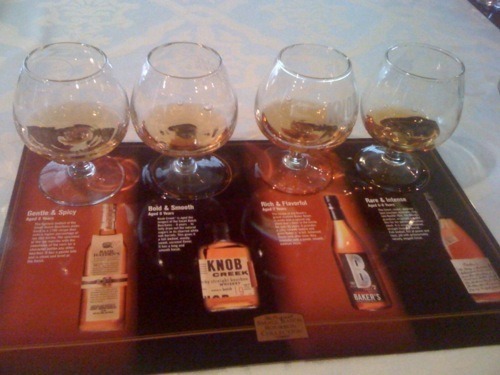 We tasted four Jim Beam products, from lowest proof to highest (from left in the photo at right). Basil Hayden. This 80 proof bourbon is named for the man pictured on the Old Grand-Dad label. “He once said that if the South lost the war, he’d never leave his house again,” Fred said. “Luckily, he lived at his distillery.” Basil Hayden (the bourbon) is light on the nose and the palate, with a spiciness from the rye in the mash bill. Knob Creek. Named for the area outside Hodgenville, Ky., and not the site of the annual machine-gun shoot, Knob Creek is the top-selling ultra-premium bourbon in the world. At 100 proof, it has a little more heat than Basil Hayden, but also more sweetness. It’s good in a Manhattan, Fred said. Baker’s. Bottled at 107 proof, this bourbon is named for Fred’s cousin Baker, the last of the Beams to live in the T. Jeremiah Beam House, where the tasting was held. Stored in the “upper half of the house,” it ages fast, achieving an intense flavor in just seven years. This bourbon packs some heat. Booker’s. “This is my dad’s baby,” Fred said, an unfiltered, uncut bourbon whose high proof (this batch was nearly 130 proof) belies its smooth drinkability. To see more photos from the Bourbon Women’s “BBQ & Bourbon” event, click here. And make plans to join us next time! 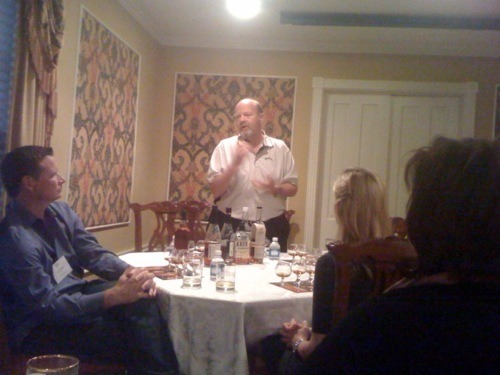 After tasting numerous bourbons over the past 10-15 years (big fan, but as an immigrant, it took a while to develop a taste being a lover of brandys and single malts), yesterday I heard the NPR/themoth.org story “Booker and me”. It tickled my curiousity, enough to try it. The Booker’s. Booker’s- it has a place on my shelf for the rest of my days. Join me for a Bourbon Babe event!